Free Baby Box bundle. 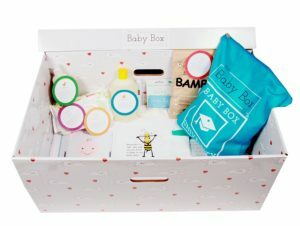 Pic © The Baby Box Co.
Expectant mums in Halton are set to receive a free box full of baby essentials to help in the post-birth stage following the launch of a new pilot scheme. The tradition originates from Finland and is credited with reducing infant mortality rates from 65 infant deaths per 1,000 births in 1938 to 2.26 per 1,000 births in 2015. Cheshire and Merseyside Women’s & Children’s Services Partnership, ‘Improving Me’ is pioneering the Baby Box initiative in the North. The partnership will issue 30,000 Baby Boxes in Halton over the course of the initial pilot scheme. The boxes are designed to replace the need for a traditional cot, as the small design prevents babies from rolling onto their stomachs, which experts think may contribute to sudden infant death syndrome. This will form some of their antenatal pathway and be supported by Halton’s midwifery service, which is part of Bridgewater Community Healthcare NHS Foundation Trust. Alongside the boxes, the soon-to-be parents will also gain membership to the online platform Baby Box University. Available from pregnancy onwards, it provides universal access to educational resources and a support system which is developed with help from leading medical experts. Programme Director for Maternity and Women’s Services, Catherine McClennan, told JMU Journalism: “I loved the model as it provides parity at birth, health care information and most importantly engagement with midwifery teams at the earliest stages of pregnancy.